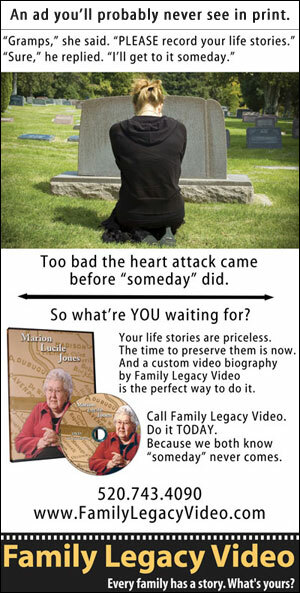 Ever thought of getting around to tackling a particular project or task “someday?” In this issue we’ll look at why “someday” doesn’t make a very good target date when it comes to creating personal legacy videos. Someday: The enemy of personal history legacies. One of the greatest challenges facing personal historians and video biographers is the lack of a sense of urgency in the general public when it comes to the idea of recording life stories. Our life stories comprise invaluable family legacies, legacies that are lost everyday when people die without recording their remembrances and values. That quote put me in mind of an ad I’d love to run (you’ll see a mock up of the ad to the left of this article) but probably won’t because it’d be too heavy-handed and off-putting for most folks. After all, few of us want to be reminded of our mortality. But it’s precisely because we all have a limited (if unknowable) number of ticks on the clock that we should feel driven to secure the legacies of our life stories to pass along to the generations of our families that will succeed us. I’m sure you can guess where this story is headed. I left a couple of voice mails for him last week. Receiving no reply, I contacted the family friend and found out our vet had died the week before. To say his family and friends were saddened would be an understatement; in this case their sorrow was amplified by the realization that he died without seizing the opportunity to complete his legacy. “Someday” beat him to the punch. When a person dies without recording his or her life stories, it’s like burning down a library filled with one-of-a-kind editions; there’s just no way to get those stories back. And while there may be some family and friends who remember those stories in whole or in part, they are generally totally lost within a generation or two. So if you’ve been putting off your own video biography for a “someday” when the conditions, whatever they may be, for tackling such a project are perfect, stop fooling yourself. The time to create your video legacy is now, while you’re still breathing. Because by the time “someday” gets here, you may not be here to greet it. Charlie Thomas video clip setting viewing records. There are a lot of people out there who like antique cars! At least that’s what the viewing stats for the video clip “Charlie Thomas: Collector” are telling us. Turns out that car enthusiastics have been circulating the link to the clip in e-mails and in online forums. Posted earlier this year, the clip has garnered 63,453 visits as of this writing. While this doesn’t equal the numbers of viewers for, say, dancing kittens on YouTube, these are very impressive numbers for a video biography site. Both Family Legacy Video and Charlie welcome the attention.